Took my annual tour north of Ozark today before the rains come this week. Caught the colors that are not showing up here. Was so happy that the wind died down to catch the reflections on Haw Creek. Some nice colors in there. Awesome capture. Oh my, it must be really fabulous to be there! Amazing colors and reflections. The water is so beautifully still. Peaceful shot. This is fabulous! Love the reflections and oh the fall colors are wonderful. Wow, the autumn colours and reflections are fantastic here Milanie. What a treat to see them. Fav. Beautiful shot, colours & reflections! Boy do I miss these colors! We have a couple nice golden yellow trees but everything else is brown- too much rain this summer and early fall. fav for the memories of more colorful times! 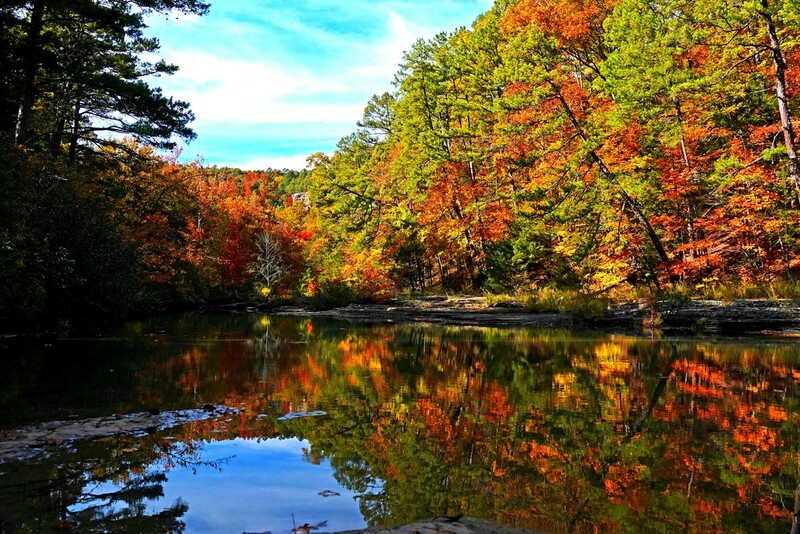 @samae This was from Haw Creek Falls - north of Clarksville - very little color near the western border where I live - but between Russellville and Jasper it was beautiful.